Product #15947 | SKU SES-AUDIO-AB | 0.0 (no ratings yet) Thanks for your rating! 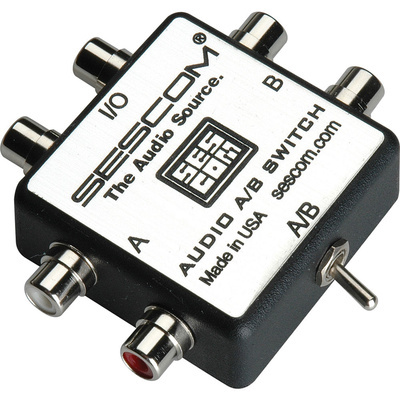 The Sescom SES-AUDIO-AB RCA Stereo Audio MP3 iPod FLAC WMA A/B Switch with left and right stereo RCA connectors can function as an input and output expansion for any equipment. The stereo audio switch can be used to switch composite video and a single channel of audio. It also protects the devices from the damage due to plugging and unplugging connectors. Suitable for home theatre, studio, and gamers, the bi-directional switch requires no power and can be easily added into any setup.